On campus health clinic to serve 2,200 patients annually, is in a medically underserved census tract, and will be accessible to both the student body and the neighborhoods that surround the college. Almost 100,000 square foot investment includes a new 47,000 square foot student center and health clinic along with a 45,000 square foot student housing facility. The project will provide 87 new student dormitory rooms that will house 171 students. The new student center will have a 2,000 seat multi-purpose arena, a 100 seat dining hall, a coffee lounge, and small convenience grocery area as well as student lounges a fitness area, offices for student government, multipurpose rooms with 3 breakout rooms for multiple concurrent conferencing sessions. The retail food operation will target residents within a 3 mile radius of the College, which is a USDA-designated Food Desert. Founded in 1867, Talladega College is located in the historic district of Talladega, Alabama. The College continues to attract the top five percent of students nationwide, offering seventeen majors and specialized attention that fosters leadership skills and cultivates individual talents. Eighty percent of Talladega’s graduates go on to pursue advanced degrees. Over the years as the college has grown, with an enrollment of more than 1,000 students, the 45,466 square-foot student housing facility will provide 87 student dormitory rooms that will house 171 students. With increasing enrollment numbers and no additional housing to accommodate, students were being displaced due to lack of occupancy. The displacement of students resulted in increased commutes and costly off-campus accommodations. Talladega College began a $19.7MM project for an almost 100,000 square foot investment which includes a new 47,000 square foot student center and health clinic. The project was financed in part through a New Market Tax Credit allocation totaling $7MM. From this transaction, United Bank Charitable Foundation, through its partnership with UB Community Development, has committed to donate $35,000 to a nonprofit in the area in support of their mission driven focus. The project is anticipated to create 26 full-time jobs that will be filled with qualifying applicants from within the project area. After completion, an additional 42 jobs are expected to be created. In addition to constructing the student dormitory, UBCD’s tax credit allocation will help construct a much-needed student activity center which will house the on-campus health care clinic. Once completed, the student center and health clinic building will include a 100-seat dining hall, full kitchen and concession stand, coffee lounge, convenience grocery store, fitness area, offices and multipurpose rooms. There is a 2,000 seat multi-purpose arena where basketball and volleyball games will be held. Additionally, the facility will house a large ballroom with three breakout rooms for multiple concurrent conferencing sessions, allowing the college, for the first time in its history, to hold on-campus convocation ceremonies, banquets and other meetings. The convenience grocery store, which is located in a designated Food Desert, and health clinic, expects to serve 2,200 patients annually and is in a medically underserved census tract, will be accessible to both the student body and to the neighborhoods that surround the college. Both the store and the clinic will serve to improve the quality of life, not only of the students, but also of the community-at-large. 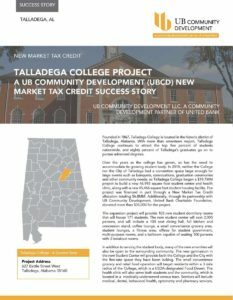 Since 2016, the U.S. Department of Treasury, through its New Market Tax Credit Program, has awarded United Bancorporation of Alabama (OTC: UBAB), the parent corporation of United Bank and UBCD, $120 million in New Market Tax Credits allocations. 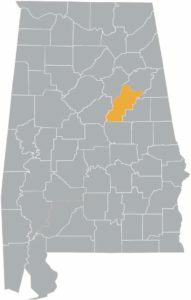 UBA, and subsequently UBCD, are the only community development entities (CDE) headquartered in Alabama to receive a New Markets allocation from Treasury in the last decade. This success was made possible largely because of United Bank’s designation as a Community Development Financial Institution (CDFI) and the organization’s unwavering commitment to its CDFI mission to bring positive and sustainable economic and quality-of-life improvements to low-income and underserved communities, not only in its traditional banking footprint, but throughout the entire states of Alabama and Florida.